Convert HDMI video to an NDI stream with the Pro Convert HDMI 4K Plus video signal converter from Magewell. Pro Convert 4K features one HDMI input and one HDMI loop-through output with eight channels of embedded audio, and it supports HDMI input up to DCI 4K 4096 x 2160 at 60 fps. The RJ45 Gigabit Ethernet port supports encoded NDI output up to 4096 x 2160 8-bit 4:2:2 at 60 fps. 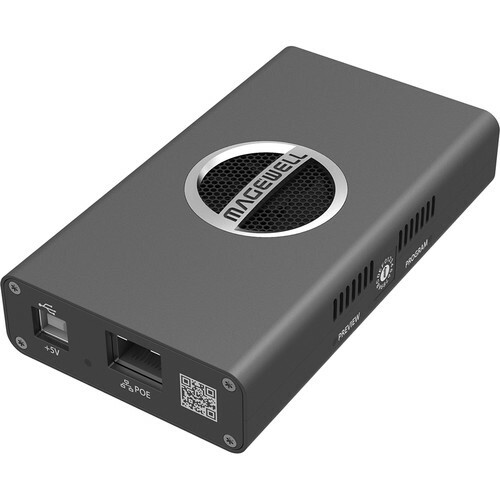 The HDMI loop-through allows you to view your input on a monitor while your NDI-encoded stream can be sent to a variety of NDI-compatible encoding or streaming applications such as OBS, XSplit, vMix, Wirecast, and others via Ethernet. The mini DIN-8 tally/PTZ port provides tally input to pass-through as well as for use with the unit's status LEDs. The LEDs also indicate power, output, and input signal status. The unit is powered by a 5V power adapter connected to its USB 2.0 Type-B port or via PoE (Power over Ethernet) over its RJ45 port. The Pro Convert can be managed with a web UI to configure settings and to perform firmware updates via the USB port. A 1/4"-20 mounting thread allows you to mount the unit in a rack, bracket, or on a stand. Included with the Pro Convert are a USB cable, a 5V power adapter, a mini DIN-8 cable, and an L-bracket for mounting. Box Dimensions (LxWxH) 8.8 x 7.7 x 1.5"